How do you think the pattern was made? How do you think the pattern would continue? 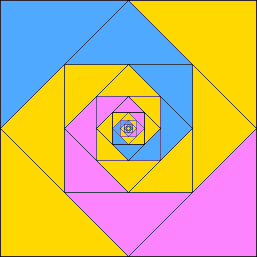 What proportion of the total area of the square is taken up by the small square in the middle? You might like to make a copy of the pattern for yourself using coloured paper. Or you could click below to show the different stages of construction of the image. If this process could be continued forever, what proportion of the image would be coloured blue? Try to provide a convincing explanation that your answer is right. Below is a collection of images created using repeating processes. 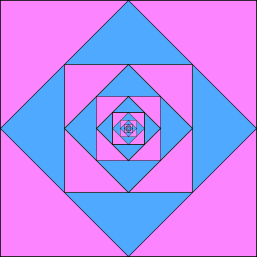 Choose a few of the images below, and work out what fraction of the total is taken up by the five largest blue shapes. 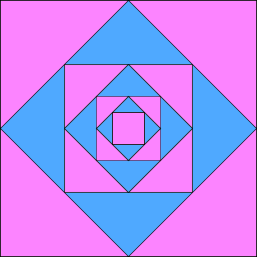 Add your fractions to estimate the proportion of the total that is coloured blue. 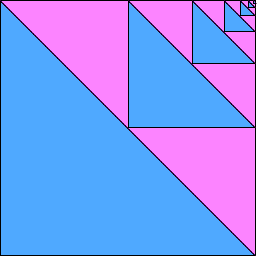 If each process could be continued for ever, what proportion of the whole image would be coloured blue? Try to provide convincing explanations that your answers are right. 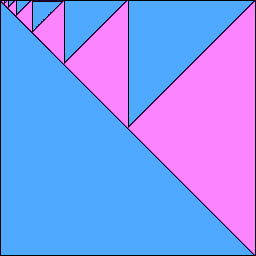 You may wish to take a look at Vanishing Point after working on this problem. Generalising. Calculating with fractions. Visualising. Interactivities. Cubes & cuboids. Infinite series. Mathematical reasoning & proof. Infinity. Working systematically. Fractions.